Vice President Mike Pence calls Juan Guaidó to let him know he has US support, before Maduro’s January 10 inauguration. Check. Guaidó announces that he is in fact president, as a leader in the sidelined National Assembly, and that Maduro’s role is unconstitutional. Check. The UK, Australia and other lapdogs come to the party (bravo New Zealand, for not). Check. Venezuelan banking assets are frozen across the world, and offered to Guaidó. Check. John Bolton appears with a legal pad in hand, with “5000 troops to Colombia” scrawled across it, obviously staged. Venezuela’s state-owned oil company is blockaded, and US officials openly muse on TV about what a great carve-up Venezuela’s oil reserves would be. Check check check. So far as mentioned above, New Zealand has not joined in the rush to embrace Juan Guaido, the self-declared ruler of Venezuela. There are very good reasons (see below) to be wary of Guaidó and his friends. In passing, our stance on Venezuela has been a good reminder – as with the UN resolution on Israel we co-sponsored in the Security Council a few years ago – that we do, on occasions, pursue an independent foreign policy. Australia by contrast, dances whenever Washington pulls its strings. We’re guided more often by the United Nations, than by the views of the Washington/Canberra axis. “The UN secretariat has decided not to be part of any of these groups in order to give credibility to our continued offer of good offices to the parties to be able at their request to help find a political solution,” Guterres told reporters. Back in Venezuela though, Juan Guaidó has been encouraged to ignore the UN option, given the uncritical support he has been receiving from the US, the Western European powers and others. The people of Zimbabwe and the Congo must be looking on with astonishment at this selective upholding of democracy by the global community. To understand Guaidó ’s rise, some brief background. After the death of Hugo Chavez from cancer in 2013, Nicolas Maduro narrowly won the subsequent presidential election (50.6% of the vote, to 49.1% for his challenger Henrique Capriles.) Moderate opposition leaders like Capriles and Henri Falcon then called for dialogue and a movement of national unity alongside the Maduro government, but other opposition figures (notably Guaidó ’s mentor, Leopoldo López) called for a confrontation intended to collapse the government, and thereby enact regime change by force. Meaning : the global community has chosen to put its support behind the leadership of the most violent, least democratic wing of the protest movement in Venezuela. The path of violent confrontation has been consistent with the strategy that the same groups pursued for the entirety of Chavez’ reign – a period marked by several failed coups and assassination attempts. Maduro himself has survived a number of attempts to kill him, one of them famously including the use of a drone. The political climate became even more heated after parliamentary elections in 2015, which saw (a) the opposition win a majority in the National Assembly and then (b) had that victory annulled by the Supreme Court. 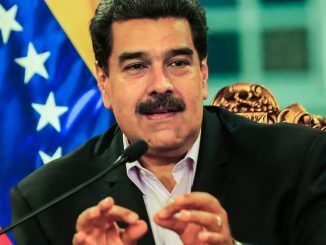 A new National Constituent Assembly was formed in 2017 after elections in which the opposition did not take part, and neither did the opposition participate in the 2018 presidential elections that gave Maduro a fresh six year term in office. Lopez is currently under house arrest, as part of his sentence for leading the violent “guarimbas” protests of 2014, which resulted in at least 43 deaths among Maduro supporters and opponents. The extensive political and financial links that have long existed between the American far right, Lopez and Guaidó have been outlined at length in this article. Since Chávez’s death in 2013, Maduro has handed over large parts of the economy to the military, including top jobs at the state oil producer and control over food distribution. He’s promoted hundreds of generals and admirals, and active and retired military officials hold nine of 34 cabinet posts. Incidentally, the mullahs in Iran have taken much the same tack by enabling the Revolutionary Guards – the supposed defenders of the Islamic Revolution – to gain virtual control of almost every sector of the Iranian economy, including the fruits of the smuggling routes that the US sanctions on Iran have, if anything, only enhanced in value. In both Iran and Venezuela, political survival has come at the cost of institutionalising military corruption. In Venezuela, if the military do move against Maduro, it will only be because Guaidó , Lopez and their US sponsors will have promised them even more riches after regime change has been enacted. As recently as May of last year, a military-led coup attempt (called Operation Constitution !) failed, with 30 military officers being arrested and tried for treason. Looking ahead, it is hard to be optimistic. Venezuela has become dysfunctional and authoritarian. Much of its population suffer from serious food and medicine shortages, and hundreds of thousands of refugees have fled into nearby countries. Part of the blame for this situation can be laid at the door of the Chavez/Maduro governments; but there has also been this very well organised campaign (lavishly financed from abroad) that has had the express aim of collapsing the country’s economy. It has been led by some of the most unsavoury, ultraviolent elements in the opposition, and in the past month, the West has rushed to embrace them. So far the regime change forces aren’t pushing to simply install Guaidó; they want fresh elections, at which tens, perhaps hundreds of millions of dollars would be pumped into opposition parties from abroad….Once Popular Will manage to get themselves installed in power, the great shock doctrine sell-off — of Venezuela’s publicly-owned industries, and extraction rights for its oil — will begin, together with violent retribution against Chavistas. The GDP might well recover; the poor, deprived of the numerous subsidies they still receive under the current government, will get no benefit from it.